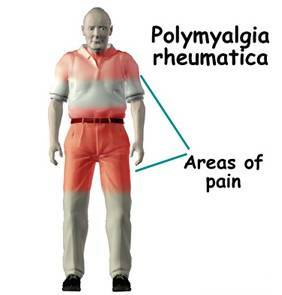 Polymyalgia rheumatica is a rare, inflammatory condition that causes pain or aching in the large muscle groups, especially around the shoulders and hips. Polymyalgia literally means "many muscle pains." 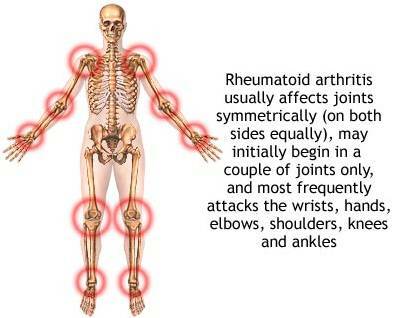 Rheumatica means "changing" or "in flux." About 15% of people with Polymyalgia Rheumatica also have temporal arthritis and about half of people with temporal arthritis also have Polymyalgia Rheumatica. Temporal arthritis causes inflammation that damages large and medium-sized arteries. The name of the condition stems from the fact that some of the affected arteries provide blood to the head, including the temples. Temporal arthritis is also known as "giant cell arthritis." What Are the Symptoms of Temporal Arthritis? Severe headaches, the most common symptom. Jaw or facial soreness, especially with chewing. Vision changes or distorted vision caused by decreased blood flow. Stroke may occur in less than 5% of patients and is caused by decreased blood flow. 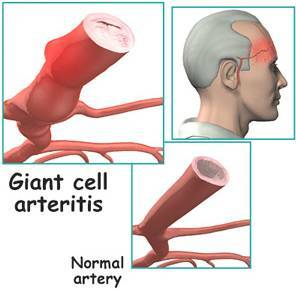 The large blood vessels may become narrowed or enlarged (aneurysm). If narrowing occurs in the blood vessels leading to the arms or legs, patients may notice fatigue or aching in the limbs, due to a reduced blood supply. Your doctor may notice weak or absent pulses. Other symptoms may include fever, weight loss, night sweats, depression, fatigue, and a general feeling of being ill.
Who Is Affected By Polymyalgia Rheumatica and Temporal Arthritis? Polymyalgia rheumatica and temporal arthritis frequently affect the same types of people. People over 50 years old are most often affected. 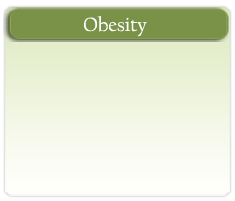 The average age of patients is 70. These diseases are more common among women, and Caucasians are more likely to get these diseases than other ethnic groups. The exact cause of these illnesses is unknown. How Are Polymyalgia Rheumatica and Temporal Arthritis Diagnosed? If a doctor suspects polymyalgia rheumatica after hearing a patient's symptoms and the examination, then blood tests will likely be done to help confirm the diagnosis. The blood tests will help test for inflammation as well as help rule out other possible causes of the symptoms, such as rheumatoid arthritis or an underactive thyroid. Everyone with polymyalgia rheumatica is also tested for temporal arthritis. This, too, would start with the examination and listening to the patient's symptoms. If temporal arthritis is suspected, but less convincing features are present, a temporal artery biopsy may confirm the diagnosis. The biopsy is taken from a part of the artery located in the hairline, in front of the ear. In most cases the biopsy is helpful, but in some individuals it may be negative or normal, even though the person does have temporal arthritis. Can Other Problems Be Confused With Polymyalgia Rheumatica? How Are Polymyalgia Rheumatica and Temporal Arthritis Treated? There is no known cure for polymyalgia rheumatica and temporal arthritis, but these diseases can be treated and controlled. Corticosteroids -- often called "steroids" -- help rapidly relieve the symptoms of both polymyalgia rheumatica and temporal arthritis. Treatment with steroids -- usually in the form of prednisone -- is mandatory for temporal arthritis to prevent serious complications, such as blindness. Low doses of steroids are often successful in treating polymyalgia rheumatica. Higher doses are often required to treat temporal arthritis. The excellent response to treatment is so uniform that the lack of dramatic improvement, within days, would make the diagnosis of temporal arthritis or polymyalgia rheumatica doubtful. Steroids reduce the function of inflammatory cells that cause these illnesses. 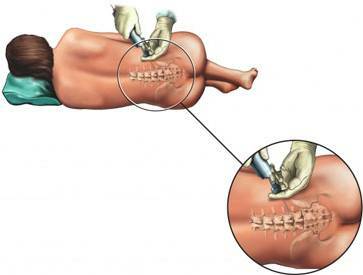 Consequently, steroids minimize tissue damage. Steroids also reduce the normal activity of the immune system -- thus increasing the risk of infection. The decision to prescribe steroids is always made on an individual basis. Your doctor will consider your age, presence of other illnesses and medications you are taking. Your doctor also will make sure you understand the potential benefits and risks of steroids before you start taking them. You will have frequent blood tests while taking steroids to monitor possible side effects and to evaluate the effectiveness of therapy. These blood tests can usually detect problems before you are aware of any symptoms. Your doctor will frequently evaluate your heart and lung function and blood sugar level, which may increase after you start taking steroids. While taking steroids, it is important to keep all appointments with your doctor and the laboratory, and have your blood pressure checked regularly. Because steroids increase your chance for developing infections, report symptoms such as a cough, fever, or shortness of breathe to your doctor. Long-term steroid treatment (for a few months to several years) requires additional testing and monitoring. Long term use of steroids can cause osteoporosis (bone loss). Taking supplements of calcium and vitamin D, sometimes along with prescription medication is recommended to prevent osteoporosis. Discuss the potential side effects caused by long-term steroid therapy with your doctor. What Is the Long-term Outlook for Polymyalgia Rheumatica and Temporal Arthritis? With careful monitoring and appropriate treatment, most patients with Polymyalgia Rheumatica or temporal arthritis have a normal life span and lifestyle. The success of treatment is related to prompt diagnosis, aggressive treatment and careful follow-up to prevent or minimize side effects from the medications.